My thanks to Steve and Timi at MX Publishing for my copy of this book. Undershaw forever! This book takes four of Sax Rhomer’s Chinatown stories and re-imagines them as Sherlock Holmes stories. The Chinatown is of course the Limehouse district of London. Sax Rohmer’s famous Fu Manchu often inhabited Limehouse to the torment of Sir Denis Nayland Smith and Dr. Petrie. The four stories are very short, as the book itself is only 158 pages including a rather long preface. As Holmes stories go, they are a bit bland. 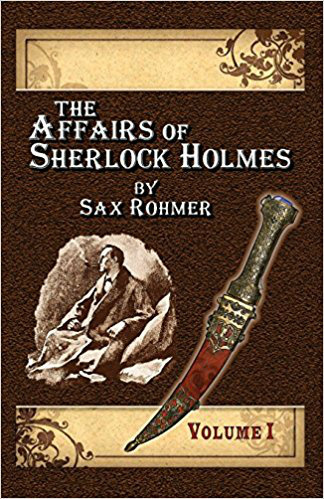 They are not terrible stories, but it seems to me that in making these into Holmes stories detail is lacking from the way the original tales of Holmes and Watson by Sir Arthur Conan Doyle were written. I will give kudus to the story that features Professor Moriarty! In the preface, Alan Lance Anderson has some strong things to say concerning modern pastiches of Sherlock Holmes. I concede that he has a point that has bothered me at times. My own point is that re-imagining other writer’s characters into Holmes stories simply because they have the language and knowledge of Victorian England correctly, is a disservice to those writers. They made their stories to stand on their own. It was tempting to writers at the time to jump on the Sherlock Holmes wagon. Some did, only to toss the tales away and focus on their own creations. Sleuths such as Solar Pons, Sexton Blake, The Thinking Machine and others had their own quirks. But they are still wonderful tales of mystery and deduction!